Railways may not be the first thing you think of when it comes to the "Aloha" State, but indeed the island is still home to a couple small railroads. Historically, the Hawaiian archipelago was actually home to many railroads, and at least one ran on each of the main Hawaiian Islands. In today's blog, we'll explore some of these railroads. The Island of Hawai'i, otherwise known as the Big Island, was home to the only standard gauge railroad in the future State of Hawaii, the Hilo Railroad, which later reorganized as the Hawaii Consolidated Railway. A story map tells the story of the railroad much better, and more in depth, than I ever could. The mainline of the HCR was the longest of all the railroads in Hawaii, although the Oahu Railway & Land Company covered more ground. And like the OR&LC, this railroad owed it's existence to Benjamin Dillingham, who used the railways to transport sugar from the interior parts of the Islands to ships en route to the United States, to which Hawaii enjoyed free trade. 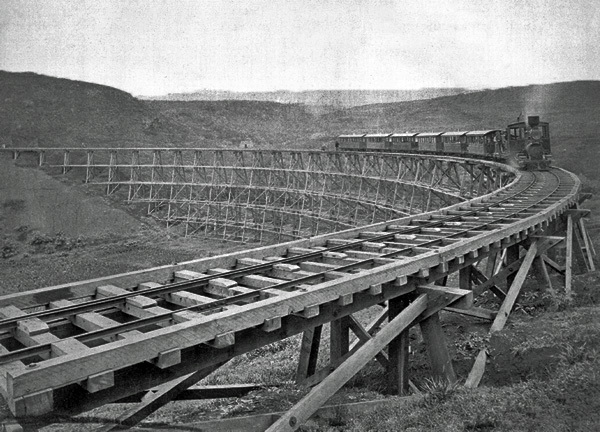 The railroad faced steep competition from the trucking industry, and was an expensive and expansive engineering marvel, navigating the rugged East coast of the Big Island. It was profitable until it was extended 33.5 miles north in 1907. World War II was kind to the railroad, as tourism increased to the island, it appeared as though the line might turn a financial corner. Although this did not occur as I've covered previously, as a massive tsunami on April 1, 1946 stemming from the Aleutian Islands would destroy the right of way and the railroad's operations. Most of the right of way is now the Hawaii Belt Rd, or the Mamalahoa Hwy, as the bankrupt railroad sold their land to the Territory of Hawaii. Today, a train museum also exists in Laupahoehoe, near the right of way of the former HCR. Another railroad, the aptly-named Hawaiian Railroad, served the far North end of the Big Island, began operations in 1882, and would close on October 29th, 1945. This railroad also served the sugarcane industry, and was proposed to connect to the HCR, but this never came to be, as neither railroad had the capital to complete the gap between them. A railroad runs on the Island of Maui even today, albeit a tourist train. 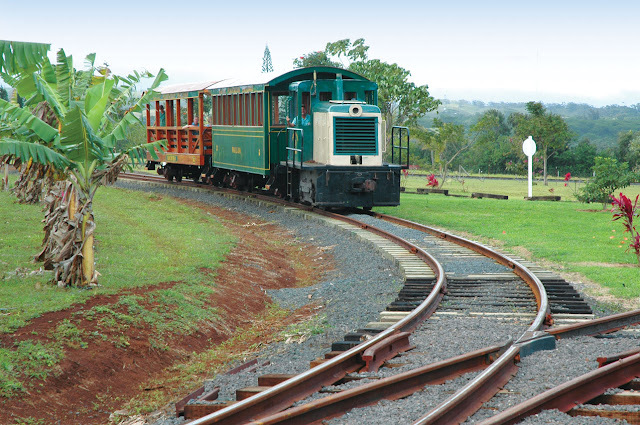 The heritage line, the Lahaina Kaanapali and Pacific Railroad runs the Sugar Cane Train on the West side of the island, between Lahaina and Kāʻanapali, for about 5 miles. The heritage line keeps alive the history of rail transport on the island. The original right of way was once part of a 200 mile network of rail lines on the island, almost all of which for transporting sugarcane, much like the Big Island Railways. Another benefactor of the duty free sugar trade to the United States was the Kahului Railroad, which connect Wailuku to Kuiaha on the North end of the island. While it would succumb to the trucking industry like every Hawaiian common carrier railroad, it enjoyed the longest life of any railroad in the State, as it remained in service until 1966. 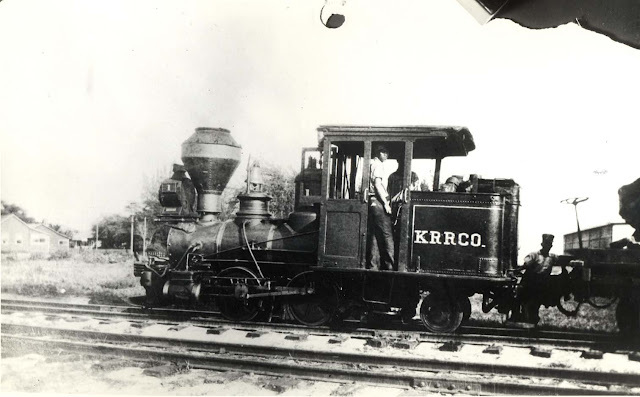 Some of it's equipment was donated to the LK&P railroad, and is thus still alive today. The company itself is alive too, as Kahului Trucking & Storage. Now part of a farm/museum called Grove Farm, The Kauai Plantation Railway keeps the railroad and sugarcane industry's history alive with a 2 mile tourist train around a plantation near Lihue, HI. 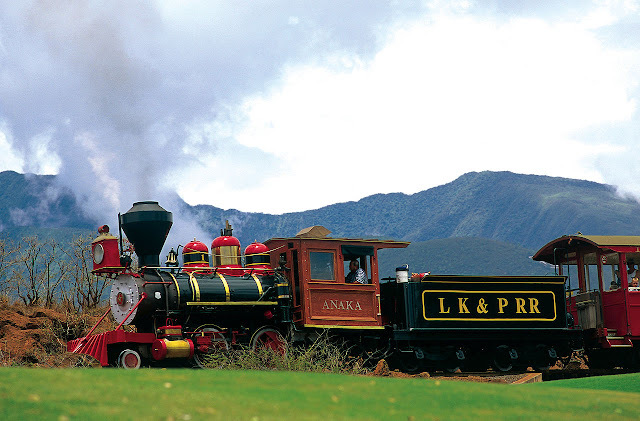 It's history dates back to the early 20th century when it was one of many plantation railways in Hawaii. 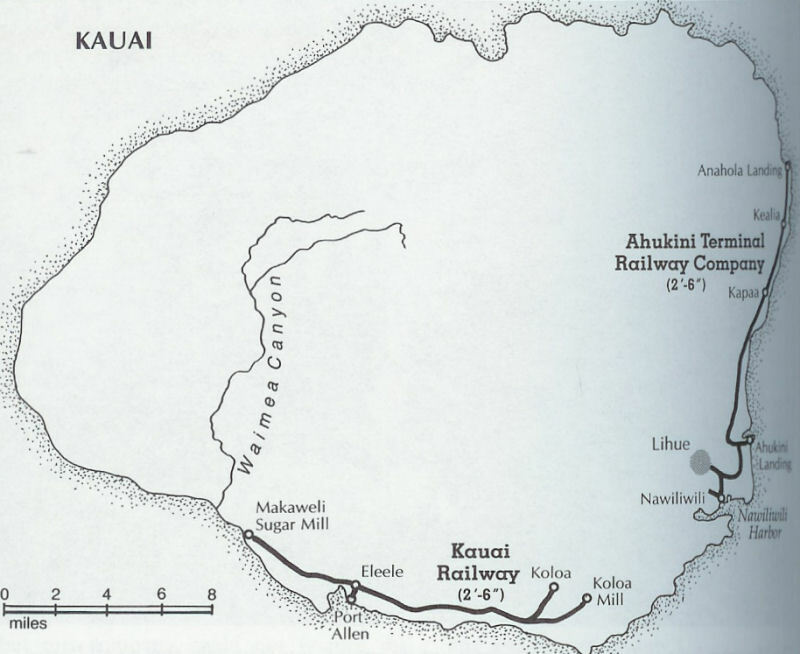 It was part of a much larger railroad history on the island, highlighted by the two common carrier railroads who ran on Kauai: The Kauai Railway and the Ahukini Terminal and Railway Company. 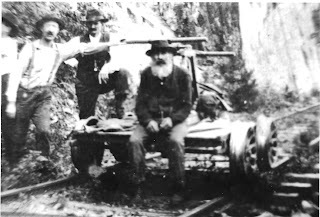 The Kauai Railway ran along the South coast of the island between Port Allen and Kalaheo on a narrow gauge right-of-way. Opening in 1907, it would last until the sugarcane industry turned to trucks to transport goods along the route in 1947. One locomotive survives at the Grove Farm, also home to the Kauai Plantation Railway. Map of each railway on Kauai, not including plantation railway lines. The Ahukini Terminal and Railway Company ran on the East side of the island, connecting Lihue with Anahola, a distance of about 12 miles. It survived a little longer than the Kauai Railway, ending service in 1959. Despite being a younger railroad, I can't seem to find any pictures of the line's rolling stock. I combined the entry on these two islands, since there was only one railroad on each of the islands, each of which was used to transport sugar, like the rest of the railroads mentioned in this blog. On Lanai, the Maunalei Sugar Company began railroad operations in 1899 near Keomuku, a ghost town on the Eastern part of the island. Quite soon after operations, by 1901 a plague occurred, forcing the plantation to close down. Local legend places the blame for the plague on the Company's building near a Hawaiian Temple, and damaging sacred sites in the process. 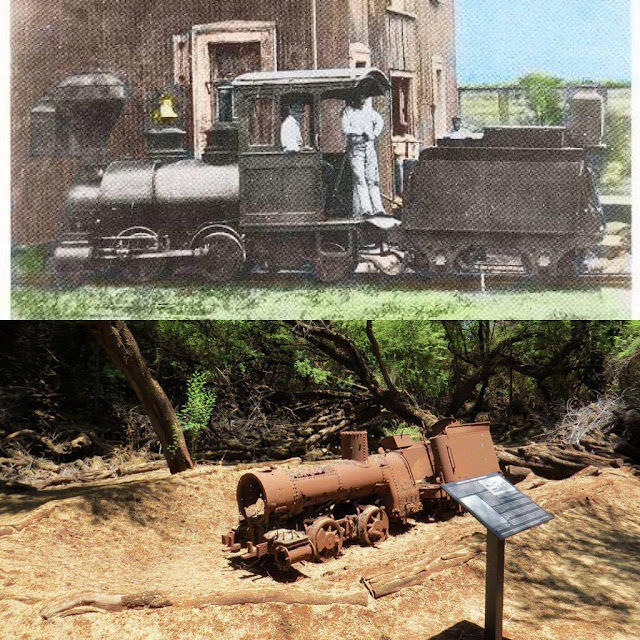 Despite only operating for three years, a locomotive ruins and rails can still be found on the island. 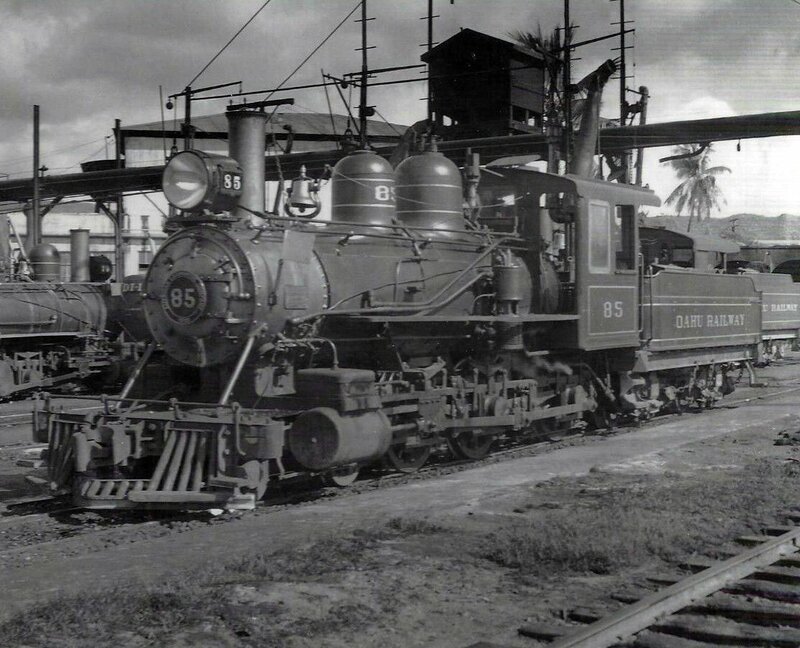 The same locomotive would also be used for railway operations on Molokai Island by the American Sugar Company. As Hawaii's most populous island, Oahu has probably the most expansive railway history, other than perhaps arguably the Big Island. The island was home to plantation railroads, military railroads, and is still home to Honolulu Rail Transit. 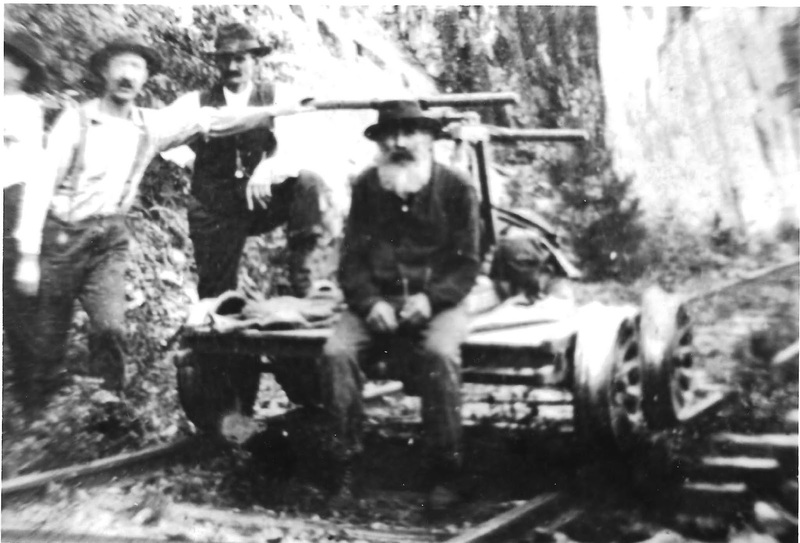 Benjamin Dillingham, the same father of the Hilo Railroad, conceived the Oahu Railway & Land Company in an effort to improve transportation on the island. Beginning service in 1889 between Honolulu and Aiea, the railroad only continued to grow. By 1898, the mainline extended to Kahuku on the island's West side. It was proposed, although never seriously considered to circumnavigate the island in a circle. Rather, numerous branch lines were constructed. 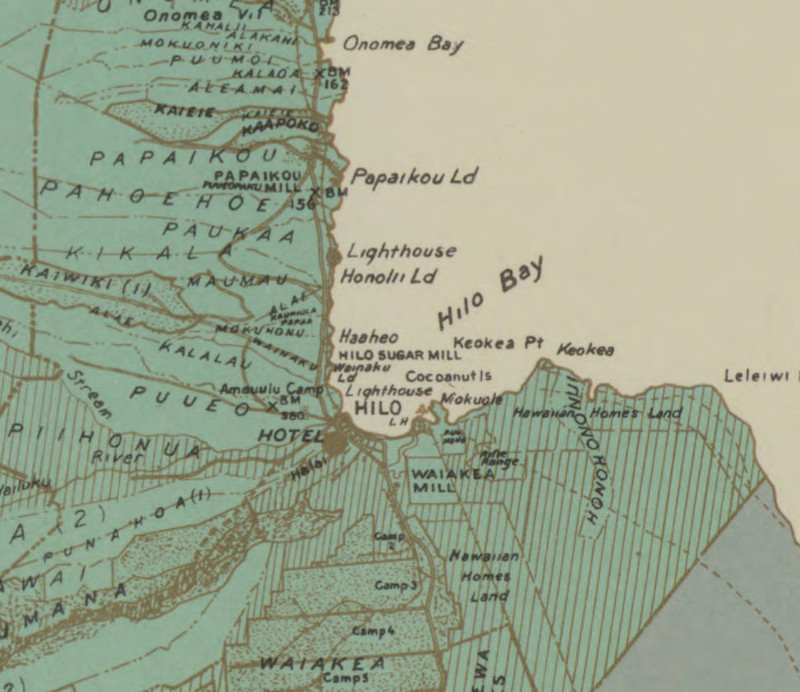 In 1905, the Koolau Railway would make but one step closer to a circular route, connecting with the OR&LC at Kahuku, and running 10 miles south to Punaluu. The railway was unsuccessful, and would fold in 1932, merging with a nearby plantation railroad, thus keeping operations alive until 1954. Koolau Railway Train. 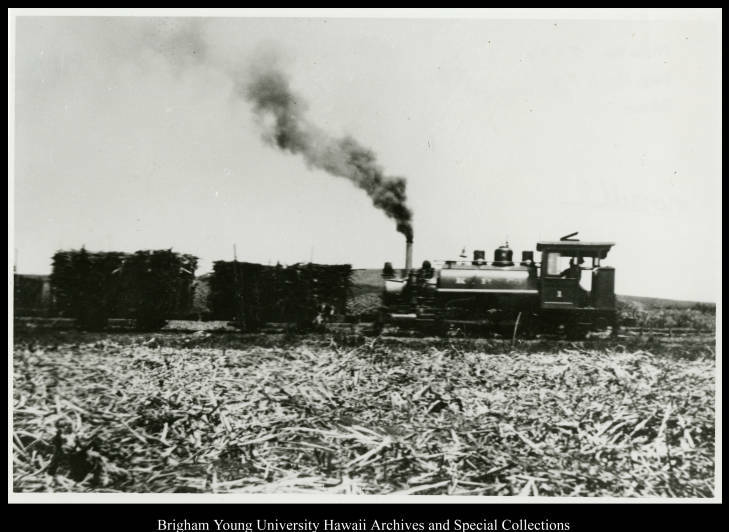 Image: Brigham Young University-Hawaii Archives. 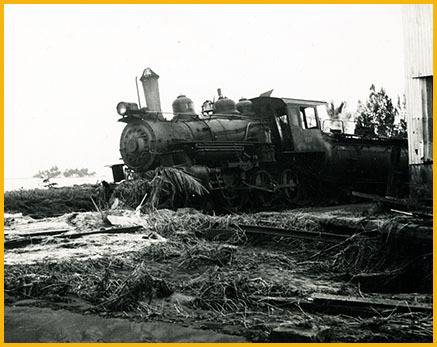 Much like the Hawaii Consolidated Railway, the Oahu Railway & Land Company also suffered damage due to the April 1, 1946 tsunami, but in this case the damage was not fatal. A plantation worker strike in 1947 also contributed to the line's demise, but the OR&LC mainline was in service until 1959. A branch line in Honolulu's harbor would reorganize as the Oahu Railway would remain in service until 1971. The Hawaiian Railway society was organized in 1970 to keep the history of railroads in Hawaii alive and to build a museum, and eventual heritage operation. Today, the ROW of the OR&LC is now active as the Hawaiian Railway between Ewa, HI and Kahe Point, HI. Each major island in Hawaii had at least some railroad operations on it. 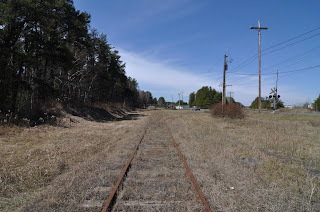 This blog does not go into detail on some of the more obscure plantation railroads, and there is still more to learn out there when it comes to the archipelago's railway history. Nonetheless, I hope you enjoyed today's blog and found it informative. The caboose is the ultimate relic of a bygone era in railroading. All but completely removed from revenue service, most cabooses today sit idle as reminders of railroads which once traversed this country. They frequent museums, stations, and the yards of the random railfan. ATSF 999730 at the rear of the Argonne Switcher operation in July, 2014. 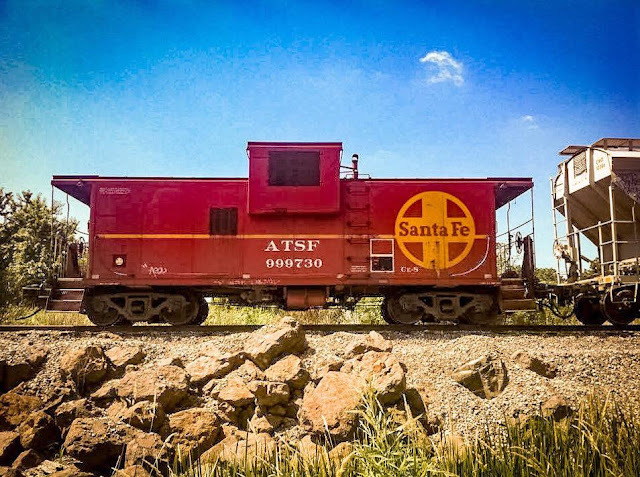 There are still some cabooses in service, usually for local operations, where an operation requiring heavy switching can benefit from a crew at the rear of the train, which is the case for the Santa Fe caboose above. Cabooses were used until 1982 for safety reasons, and to transport crew. The US Government deregulated their use, and as such, they became nearly obsolete as crew members dwindled from an average of 7 per train, to an average of 2 today. End of train devices and cars are now the norm, and what would wind up replacing cabooses, which allows both engineer and conductor to ride in the front of the train. There are a number of cabooses around the suburbs of Chicago, sitting idle. A couple are in safety towns in Naperville and Romeoville, something that has fascinated me since I was a kid. I'm certain there's also more than what I've photographed, as even yesterday I was made aware of one in Arlington Heights. 1) CB&Q 14351 at the St. Joseph Forest Preserve. 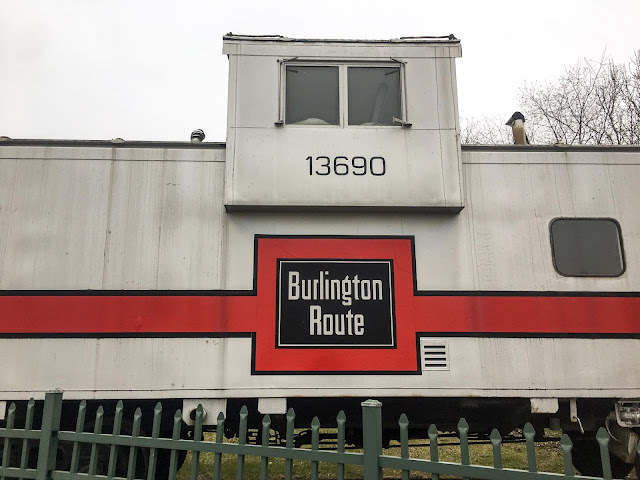 This caboose sits idle near where the Chicago Aurora & Elgin interurban ran through the St. Joseph Forest Preserve, once a park owned by the McCormick family. Two historical plaques adjacent to it tell the story of the CA&E, as well as how the caboose came to the farm, won at an auction sometime in the late 70's. Located near Chessie's Restaurant, which was once an ice house, this historic caboose helps with the aura of the railroad, as part's of Chessie's is designed to look like the interior of a dining car. Chessie's is located just south of the junction of the Chicago & Northwestern (now UP), and the Elgin Joliet & Eastern (now CN) lines, and while you might catch a CSX train using the trackage, the Chessie had no presence in Barrington. This caboose is a recent addition to the amazing Volo Auto Museum. What makes this especially interesting is that the caboose is open to view from the inside, and the museum has done a good job of making it comparable to what life was like for railway crew members during their use. Milwaukee Road Caboose, although it's sign has faded away. Rochelle Railroad Park sits at the junction of two active mainlines for BNSF and UP train traffic, and as such is a magnet for railfans. A few historic pieces are on display, as is a crossbuck. Sadly, this caboose sits on an overgrown section of the park on the other side of the street. Personally, I think it needs a little TLC. It is partly for this caboose for why I did not come back impressed from my visit to the park. Another CB&Q caboose sits idle just outside the Aurora Transportation Center. Near it lies the historic Aurora Roundhouse. This marks the end of the current BNSF Railway and "Racetrack", as the mainline becomes dual-tracked west of Aurora. At a depot adjacent to the ex-EJ&E track sits a reminder of Plainfield's heritage. Another railway, the Aurora Plainfield & Joliet interurban railway used tracks on the street just off of this location. Another EJ&E caboose is housed in Morris, IL. It is unclear if the EJ&E ever ran through here, although their main activity was located along a beltway away from the City of Chicago. The active tracks immediately north of here are currently BNSF tracks. This ex-Rock Island caboose sits dormant near an empty lot off of Oakton St in Arlington Heights. Originally a shopping center, it's both a reminder of the Rock, and the only remaining structure in the lot. It sits across from a chemical manufacturing plant. As an aside, the two preceding cabooses represent some of the extremes in temperature from my photos. The Morris photo, taken in May, was during an unseasonably hot day where the temperature was 95 degrees, and the Arlington Heights photo was taken when it was -2 outside! Bolingbrook's "other" railroad, aside from the abandoned BNSF spur, is another that piqued my interest growing up. An ATSF caboose was purchased and installed at a landscape company on the west side of town, far from any railroad, past or present. There were reports of this becoming an ice cream parlor awhile back, but I haven't heard anything recently about that. The hopper and crossbuck were installed within the last few years. Who would've though a clothing alteration service would be home to a caboose? It's owners must be railfans. While the store does sit near very active Union Pacific tracks, those are on the opposite side from the parking lot where this caboose calls home. This caboose is painted in Wabash colors for the once owner of the adjacent now-Metra tracks. But if you look closely, you can see that it actually spent it's life with the EJ&E. 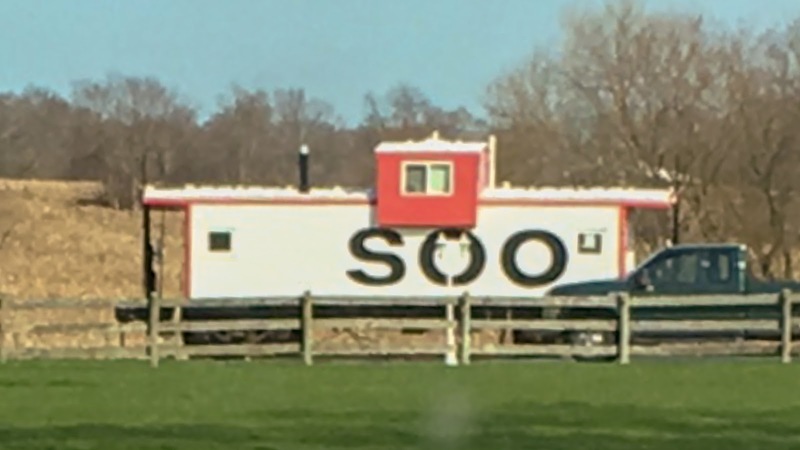 Running through Lake County, the Soo Line is now part of Canadian Pacific. As this caboose is located on a private residence, I don't have a better picture of it, and won't disclose the location. It is visible from the street, so I did not trespass to get this picture. 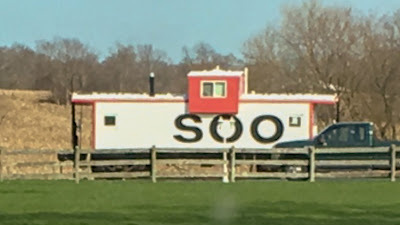 In a park on the southwest corner of Grand Av and Fairfield Rd lies a Soo Line Caboose, which is also a PokeStop, for those who play Pokemon Go. The Soo Line ran a couple miles north and east of here, as is today's Metra North Central Service. I'm sure there's plenty of other cabooses in the area, and there are some other examples of Rolling Stock on display. I have some on my Railroad Points of Interest Map, a map of POI's in the railroad industry that, like my more famous Abandoned Railroads Map, I'm working on at my leisure. And of course, there's still much more to add! As always, I hope you enjoyed today's blog, thanks for reading! As I've discussed before, the City of Chicago has been most radically transformed in the recent past near the Chicago River. The area east of the river (and south of Roosevelt), once home to large railyards and industry, has been transformed into parks, condos and shopping centers. But what about the area west of the river? 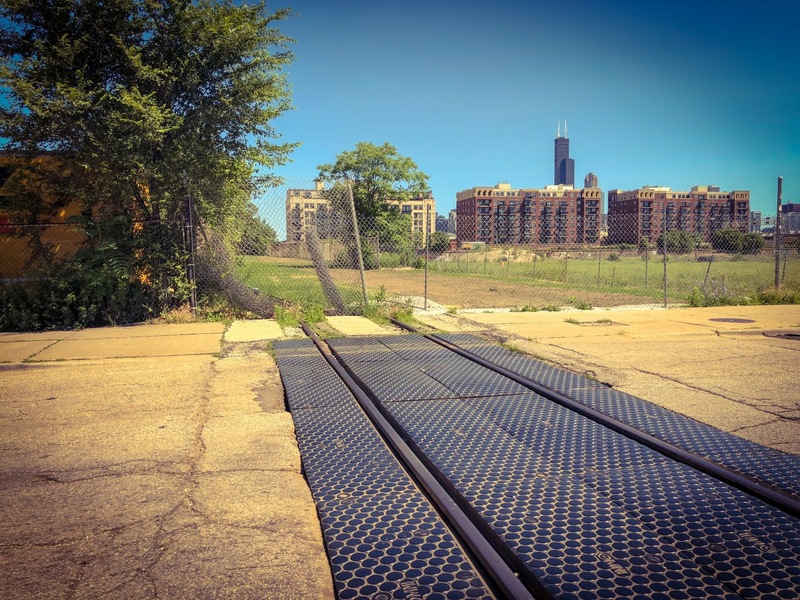 This is where things get a little more confusing, as East Pilsen is still quite industrious, but at the same time, is also undergoing some of the change that has been seen on the other side of the river. West Pilsen is now home mostly to shops, businesses and homes. With the occasional tracks to nowhere. 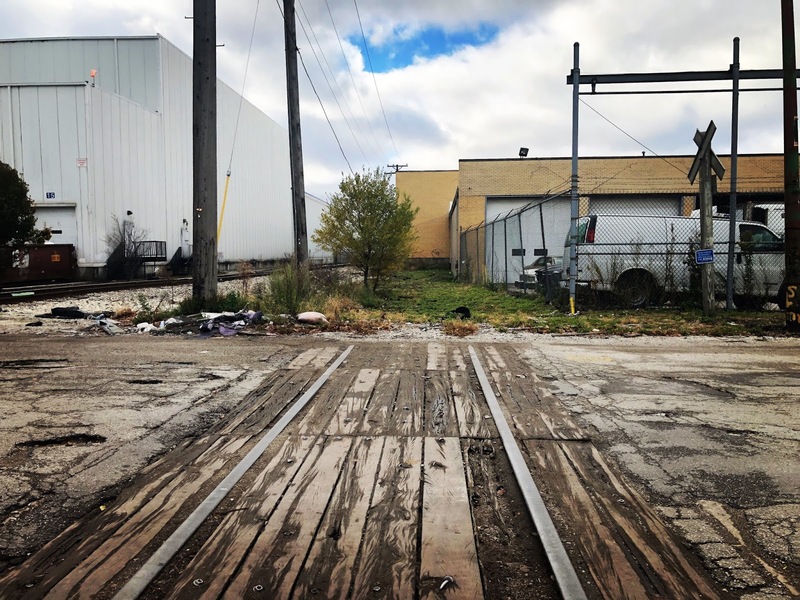 The history of Pilsen is interesting in its own right, and I highly suggest reading up on it, but my focus is on the gradual decline of railroads, especially in the last decade. If you're interested on the history of neighborhood, I recommend this page from WTTW. But from the photographer's perspective, it's quite easy to witness the gradual abandonment of railroad tracks in Pilsen. The transformation is taking longer than it did on the East side of the river. But there are plans to do so, including the El Paseo Trail, which will use some of the right-of-way of main line which ran through Pilsen. Once used by the Central Illinois Railroad (CIRY) and later BNSF, this railroad crossing sits dormant and soon to be abandoned. As shown above, even the dormant railroad crossings and tracks are just a sliver of what the area used to look like. But let's focus on the main spur trackage in Pilsen, which spurred from the BNSF Racetrack near 16th and Morgan St. The spur has existed since at least the late 19th century according to maps, and once connected the tracks to docks on the Chicago River a mile or so south of here. Also thanks to Google Maps, you can quite easily notice some of the scarchitecture of the neighborhood, much of it thanks to railroads. Some parts of the neighborhood appear to just have random railroad crossings as decorations. The difference is even more striking along Cermak Rd, where at one point, there were four railroad crossings in the span of less than 1000 feet. As a child growing up, I used to love this area for all of the crossings. The four railroad crossings were two industrial spurs serving nearby factories (at least one was disused by 2009, but the crossings were still up), and two sides of a wye, as the line ran on the south side of Cermak for about a mile before heading up Lumber St and heading down Blue Island Ave, connecting to other railways near the Chicago River. 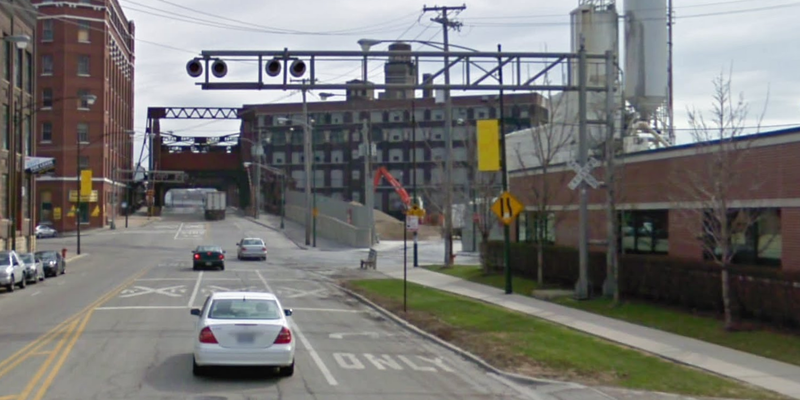 One of my all time favorite crossings, now gone, was also on Cermak, immediately west of the river, where the line crossed the road to head up Canalport. While this crossing was disused long before 2009, it was removed in about 2011. 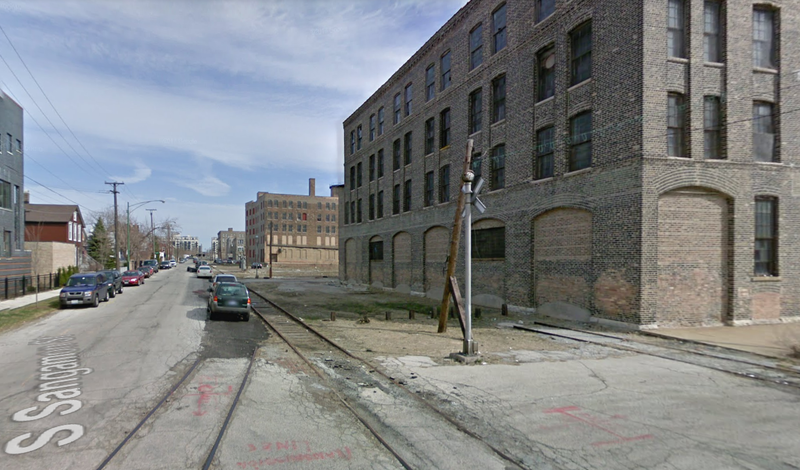 Many businesses still have abandoned rail spurs in the neighborhood too. This one is off of Leavitt St.
Part of the wye as seen from Canalport Ave. I can't wait to see what this looks like in trail form! As I've stated before, I am a big advocate for the El Paseo Trail, as I believe it offers a chance to experience Pilsen in a whole new way. As always, thanks for reading! Hi everyone, my name is Dave and I’m a guest blogger for this week. Many thanks to Andrew for allowing me the opportunity to write about this unique and relatively unknown railway. I’m a history teacher and railway historian from Thunder Bay, Ontario. My interest in this line began back in 1990, and I began formally researching it a few years later. It’s now been 25 years and I’m still at it. 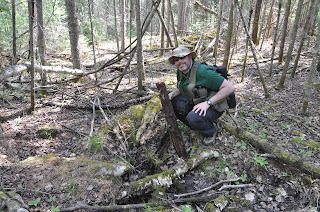 I’ve spent a lot of time in the woods of northwestern Ontario and northeastern Minnesota following the grade and exploring nearby mines, ghost towns and logging camps. This project has also taken me to numerous museums and archives in Ontario, Minnesota, Wisconsin and Illinois. So, I guess I should tell you a little about this railway. 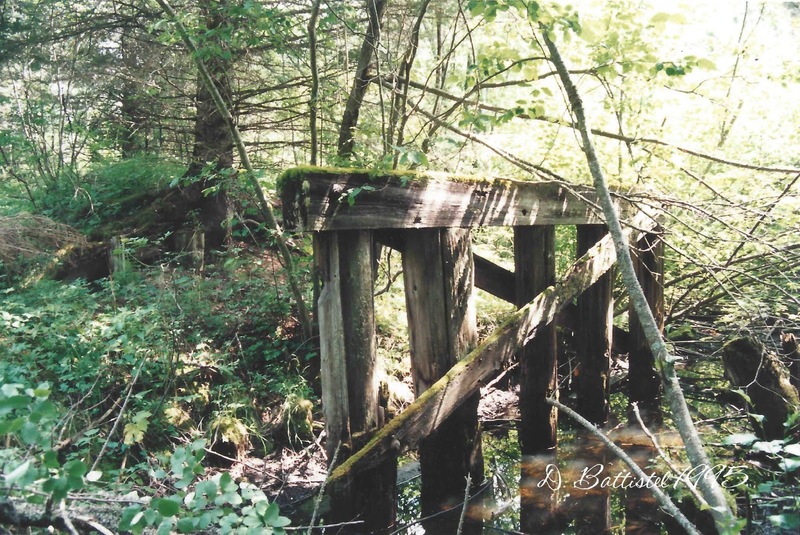 The original idea for constructing this railway dated back to 1872 when the Thunder Bay Silver Mines Railway was incorporated. Silver had been discovered southwest of what would later become the twin cities of Port Arthur and Fort William, Ontario and promoters were anxious to tap this resource, as well as providing a rail connection to Duluth, Minnesota. Nothing was done however, and the charter lapsed. Another attempt to revive the idea was made in 1881, but the application was thrown out of Parliament. Politicians argued that the plan to build so close to the boundary violated their agreement with the Canadian Pacific Railway that, “no railway be constructed within 15 miles of the border.” Undaunted, the promoters tried again one year later. 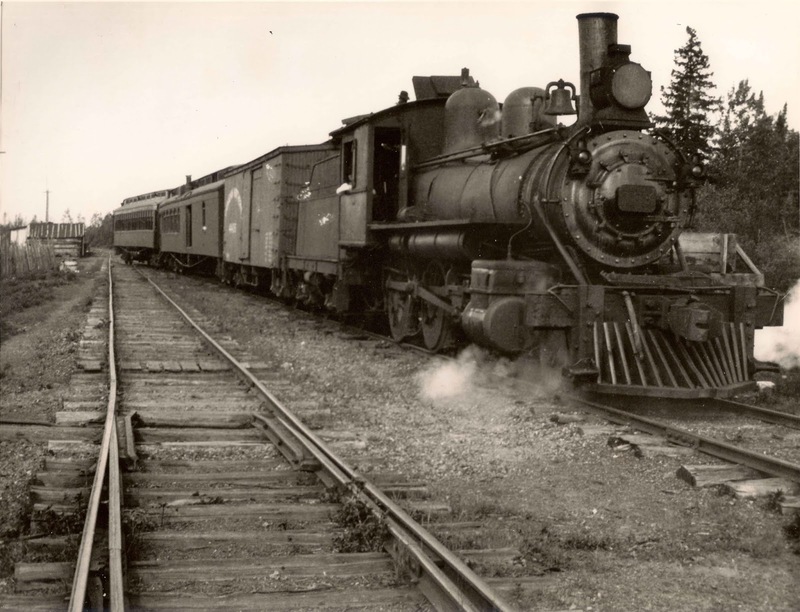 Finally, in February 1883, a Provincial charter was granted to the Thunder Bay Colonization Railway (TBCR). Now that the promoters of the railway (which included many of Port Arthur’s prominent citizens such as Thomas Marks, D.F. Burk and James Conmee, M.P.P) had their charter, their efforts were buoyed by further good news. American interests had begun construction on the Duluth and Iron Range Railroad north towards the boundary, which offered to provide the sought-after link with Duluth. As well, a large iron deposit had been discovered just across the border at Gunflint Lake, which was part of the now famous Vermilion and Mesabi iron ranges. The promoters, however, could not afford to build, having only received a subsidy from the Provincial Government. In 1887, the corporate name was changed to the Port Arthur, Duluth and Western Railway (P.A.D & W) by Provincial Statute. With subsidies later granted from the Dominion, Provincial and Municipal Governments, construction was commenced in the fall of 1889. By December 1892, the railway had reached its Canadian terminus at Gunflint Lake. 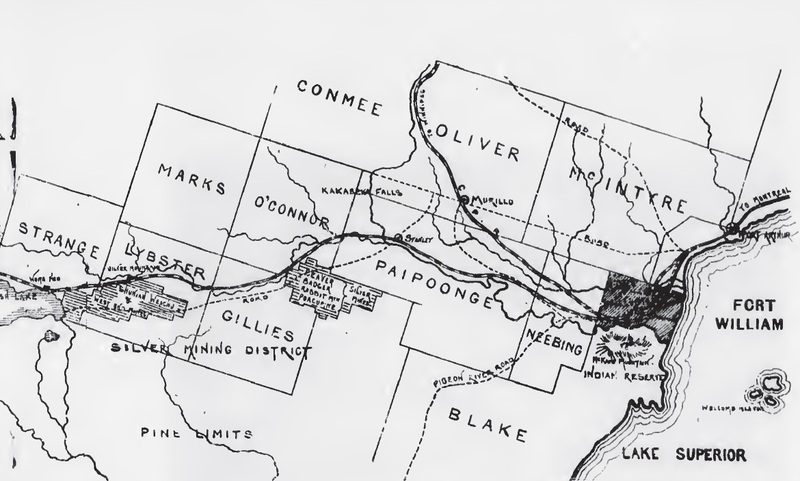 A six-mile branch, known as the P.A.D & W of Minnesota, was constructed across the border to the Paulson Mine. However, at the same time, the Panic of 1893 caused world markets to crash and led to the bankruptcy of the Gunflint Iron Company, which owned the mine. Attempts to construct the 50 remaining miles to link with the Duluth & Iron Range were frustrated by rough terrain and lack of capital. It was now a line to nowhere. Excursion train on the PAD&W, 1891. 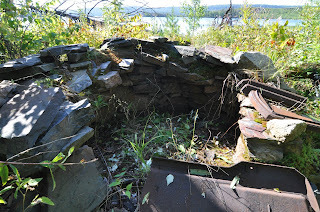 Rock oven used by construction crews at Leeblain on Gunflint Lake, 2012. 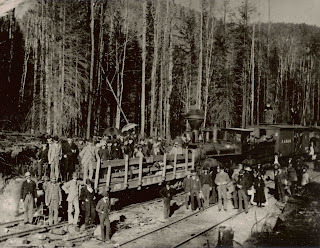 The railway was officially opened on June 1, 1893. 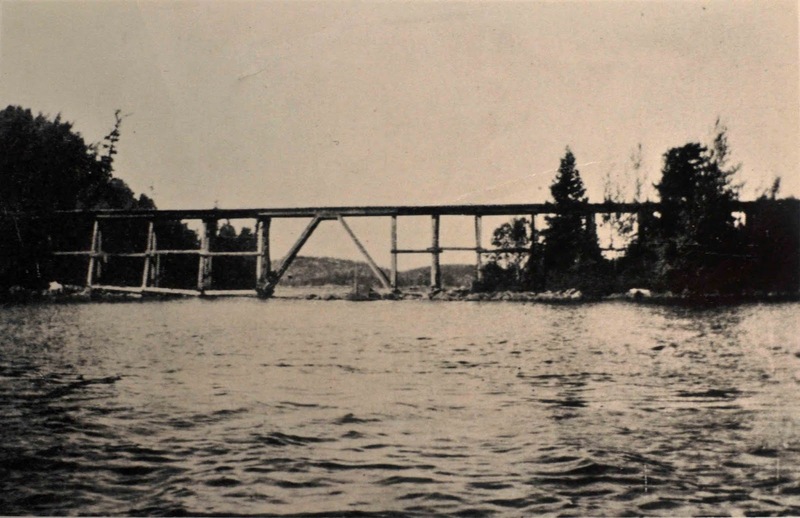 The railway wound its way 86 miles from Port Arthur (now Thunder Bay) to Gunflint Lake. After leaving Port Arthur, it crossed the adjoining city of Fort William and along the Kaministiquia River to Stanley. It crossed the river on a large trestle and followed the Whitefish River Valley for some distance. Passing Whitefish, Sand and Iron Range Lakes, the P.A.D & W turned southwest to North Lake at mile 70. From there it followed the chain of boundary lakes past the town of Leeblain to Gunflint Narrows and the iron mine. The journey would take upwards of 9 hours. Motive power was provided by four locomotives, three American type and one Mogul. PAD&W from Port Arthur to Whitefish Lake, 1893. PAD&W from Whitefish Lake to the Paulson Mine, 1893. From the date of its opening, the railway was in immediate trouble. In 1892, the silver market collapsed and the numerous silver mines along the line closed. 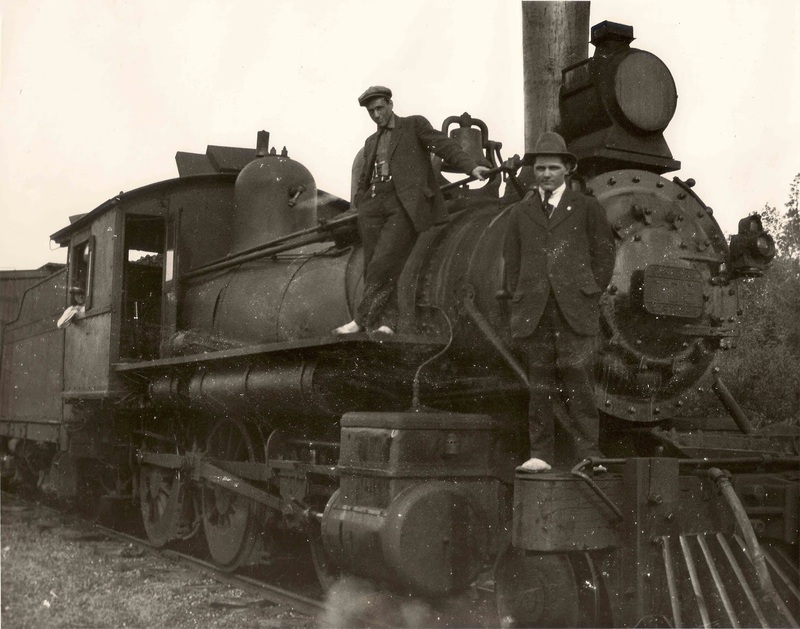 Its perpetual bad luck and constant lateness would lead noted author James Oliver Curwood to dub the railway, “Poverty, Agony, Distress and Want.” By 1898, the railway was bankrupt, and it was purchased by Canadian Northern Railway (C.No.R) for $500,000. 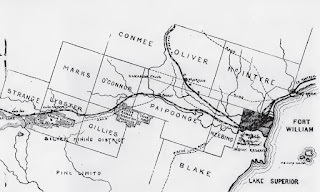 Its owners, Donald Mann and William Mackenzie, wanted the P.A.D & W’s 19 miles of road from Stanley to Port Arthur for their planned Ontario and Rainy River Railway. Under Canadian Northern, the “Duluth Extension” flourished. Many of the silver mines reopened, and passenger traffic was up. 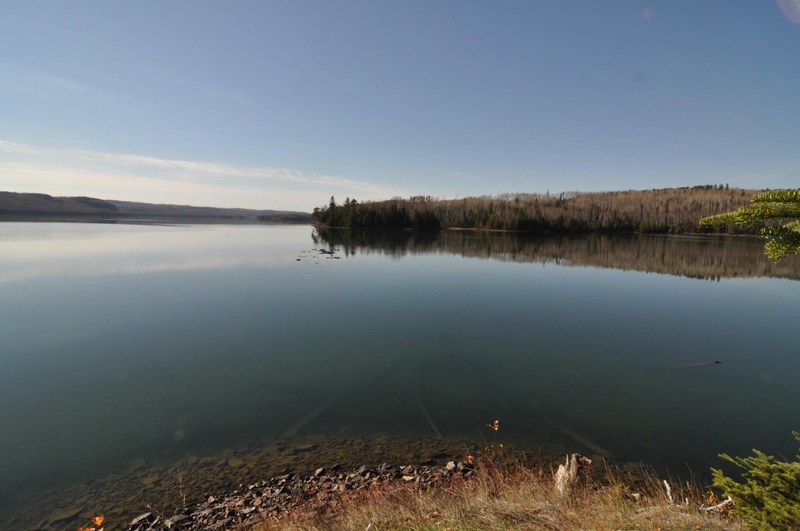 However, the section of line between North Lake and Gunflint Narrows was abandoned in 1902, but it was quickly leased by the Pigeon River Lumber Company which was engaged in extensive logging operations in the area. They built a logging line which branched off the Duluth Extension at Milepost 79 and was known as the Gunflint & Lake Superior Railroad. 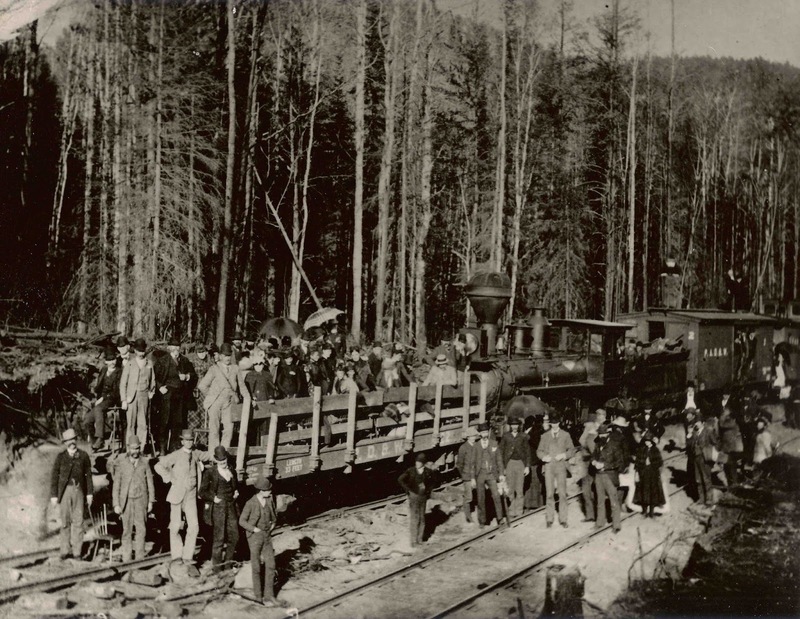 The logging at Gunflint and others along the railway made it profitable for the first time in its history. 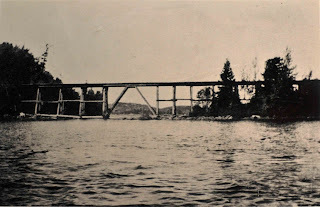 However, soon after the Gunflint logging concluded in June 1909, a large forest fire destroyed a one-thousand-foot trestle on North Lake, which severed the line to Gunflint and to the US. 2-6-0 Mogul #108 heads up a mixed train of the Canadian Northern Railway at Mackies Siding, circa 1918. 2-6-0 Mogul #108, circa 1918. 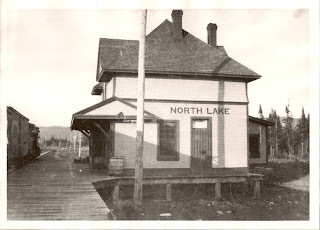 North Lake Station, a Canadian Northern 3rd class station, circa 1918. In 1915, all of the Minnesota rails and some of the rails west of North Lake were removed sold for scrap and apparently used in the war effort. In 1920, the troubled Canadian Northern became nationalized under the name Canadian National Railways (C.N.R). Now known as the CNR-North Lake Sub-Division, the “PeeDee” (as it became known) was in its twilight. In 1923, with next to no business from Mackies to North Lake, CNR abandoned that section of line. 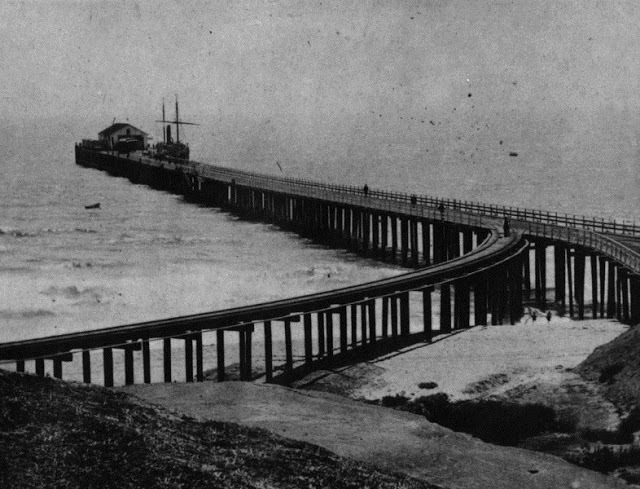 The rails were left in place and not removed until 1937. In March 1938, Canadian National gave the order to halt operations. The railway was losing money, which was compounded by the fact that many sections of line had deteriorated badly and needed to be repaired. In October of that year, CN formally abandoned the line and the rails were removed over the next year. 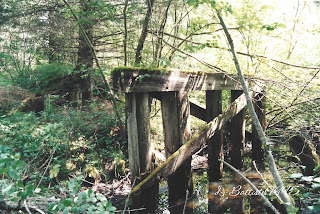 A few miles were left as an industrial spur, but they were removed in 1989. All that remains of the PAD&W is about 500 feet of track, one station and a number of rapidly disappearing relics. Last rails at Rosslyn, 2012. 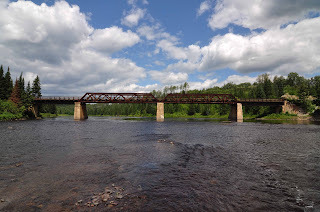 Bridge over the Kaministiquia River at Stanley, 2010. Bridge remains at Hillside, 1995. Trestle Bay on North Lake, site of a 1000-foot trestle, 2010. 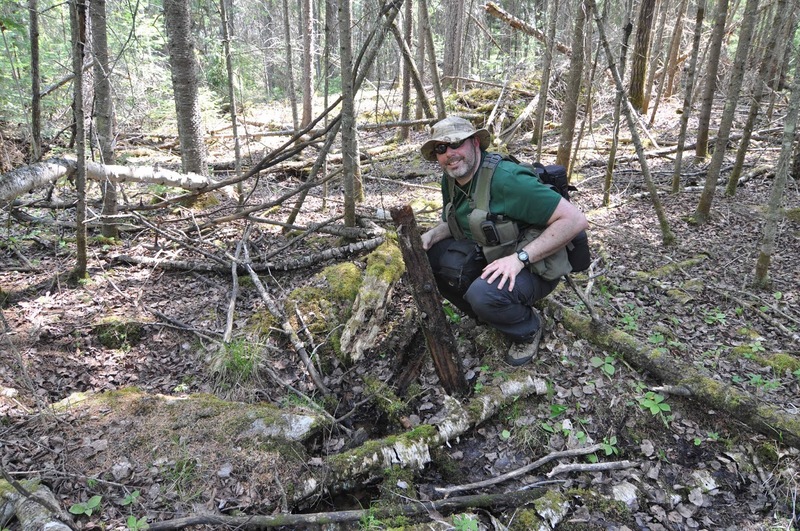 Author holding the remains of a telegraph pole on Little North Lake, 2010. My goal is to someday write my own book about the history of the railway, which is a monumental task and may take many more years. 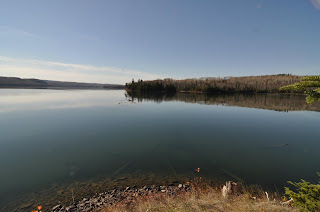 Several years ago I wrote an article about the ghost town of Leeblain for the local historical society, and for the past 5 years I have been working on a book about the logging railroad at Gunflint Lake, the Gunflint & Lake Superior. You can follow what I'm up to my own railway blog, or read more about the PAD&W. I also have a number of social media pages and a YouTube channel you can follow, which are listed below. I hope you enjoyed this little piece of history.